Facilities: 14 big inside stalls ( 10' x 14' ) with saw dust, 60' x 100' arena, round pen, inside and ouside automatic waterers, outside pen with shelter, hay available, limited one trailer hookup. Negative coggins test, call for reservation please. 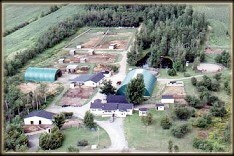 Location: 45 minutes south of Montréal, on autoroute 20 South , exit 141,( St-Valérien de Milton ) add 4 miles and you are at the farm. 2 1/2 hours from Québec City . exit 143 ( St-Valérien de Milton ). Rural neighborhood, near restaurant, motels, gas, diesel.All within 10 to 15 minutes maximum from our farm. Easy access from Autoroute 20.